Melissa Hurst and Lisa Kitchens in The Bellagio Fountain Has Been Known to Make Me Cry. Photo by Stefan Hagen. BOTTOM LINE: Water forms a thematic undercurrent to three characters’ search for renewal in a damaged world. The element of water holds strong symbolic connotations, used across cultures and eras to represent nurturing, cleansing, emotions, and feminine energy. Yet, water can destroy just as easily as it provides, poisoning or overtaking us if we disrespect its power. Continuing this archetypal tradition, The Bellagio Fountain Has Been Known to Make Me Cry uses water as a physical and thematic thread as a mother, a daughter, and a plumber seek balance within and outside themselves. Living side-by-side in the repurposed swamplands of Brooksville, Florida, middle-aged Dixie (Melissa Hurst) and her adult daughter Maria (Lisa Kitchens) share a vague but powerful yearning for a more fulfilling life. Dixie daydreams of epic romance and the illusory grandeur—and fountains—of Las Vegas, and urges her daughter to seek similar ideals. The more level-headed Maria longs for the real-world beauty of Venetian canals—but she’ll settle for a trailer park down the block if it moves her out of her mother’s influence and into a greater sense of autonomy. Hurst and Kitchens skillfully embody this mother-daughter codependency, navigating with nuance Dixie’s push for Maria’s happiness yet constant need for her, and the insistent love and duty beneath Maria’s wanderlust. Water damage and emotional turmoil seep into each woman’s space with increasing force as their carefully-constructed environments literally start sinking beneath them. The overflow from Maria’s backyard pool builds as steadily and tenaciously as her desire to escape her tiny world and craft a meaningful existence. Meanwhile, Dixie fights to reclaim her home against leaking pipes and the knowledge of her husband’s infidelity. Curtis (Heinley Gaspard), the pair’s shared plumber, is similarly haunted, as memories of his late wife fade but his guilt over her death in a flash flood lingers. Once finding comfort in water and a comfortable nonchalance in his marriage, Curtis’s torment now leaves him struggling to fix both the women’s plumbing issues and his own troubled heart. 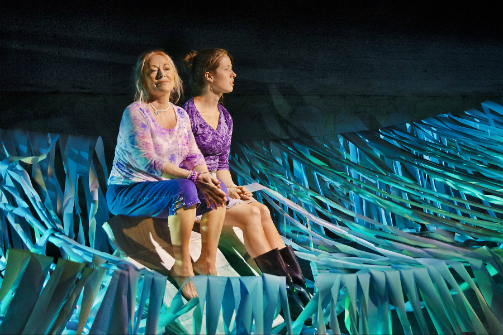 Carlo Adinolfi’s ingenious set designs bring to life water’s omnipresent role in the play. Adinolfi and performer Brianna Seagraves create the landscape of Bellagio by gracefully manipulating huge quantities of colored construction paper into the various shapes, sounds, and images of this malleable element. A floor-to-ceiling sheet of blue paper becomes the pre-show “curtain” which Adinolfi and Seagraves slice into waves to reveal both cast and scenery. The duo unfurls seemingly endless spools of paper as Dixie and Maria's leaks. They swirl and crinkle it to suggest a hurricane, and ripple it from a hanging dowel as a waterfall, fountain, or boundary between reality and dreams. Likewise, paper cutouts form the characters’ constrained but winsome world, becoming Dixie and Maria’s aching Valentine-ish hearts and the windows out of which they gaze. Environmental parallels run throughout Bellagio, suggesting that the need to meddle in nature’s affairs and micro-manage our relationships is not only ineffectual but self-destructive. We cannot gloss over emotional truth in the same manner that we build houses on drained swamps or Las Vegas hotels dye and recirculate wastewater for their fountains despite the city’s drought. Rather, as Curtis points out, we must honor water’s habits and our souls’ yearnings before either engulfs us in their natural wake. The Bellagio Fountain Has Been Known to Make Me Cry is written by Renee Philippi and co-directed by Eric Nightengale and Renee Philippi. Set design by Carlo Adinolfi. Original music by Joseph C. Phillips Jr. Lighting design by Casey McLain and Eric Nightengale. Production Stage Manager is Casey McLain. The cast includes Carlo Adinolfi, Heinley Gaspard, Melissa Hurst, Lisa Kitchens, and Brianna Seagraves.